On the Lips of Children by Mark Matthews is absolutely terrifying and chilling to the bone, quite literally within the first few pages of the prologue. Certainly not for the younger reader, On the Lips of Children is an over 18yrs read due to the horror and gore, not to mention the emotional scar it leaves behind. This is definitely a must-read for all horror fans that like a book to leave a profound impact on them. Macon is a tattoo artist and an avid marathon runner. These two interests of his are his life along with his partner, Erin, and their six year old daughter, Lyric. Erin and Macon have had their fair share of dark ordeals before they met, however nothing could have prepared them for the terrifying horror that they were about to encounter. After arriving in San Diego to run a marathon in two days time, Macon and his family check into their hotel. When Macon goes out for a pre-dawn training run in preparation for the marathon the following day, he runs along a trail that takes him across a baseball field, and further down into the dark depths of underpasses and bridges, with the highway above and the trail goes on until it reaches the beach. Along the route, Macon disturbs a homeless camp under a dark bridge, by running into a metal trolley that he couldn’t see in front of him. He tries to apologise but there are definitely some strange vibes coming from these homeless guys. Macon runs on with the thought that there was nothing more that he could do when he notices he’s being followed. Although mostly keeping their distance they do keep him within sight. ……Along the dark, remote trail at dawn, underneath the buzzing highway Erin and Lyric are kidnapped by a family of scavenging humans, dwelling in an old caved-in drug-smuggling tunnel that runs from San Diego, USA to Tijuana, Mexico. These dirty, animalistic scavengers have spent years surviving off the blood and flesh of humans. Although, completely oblivious to all what has happened as he was on the beach at the time, Macon runs back along the trail to the hotel only to be informed by Mex of where Erin and his daughter have gone. Macon returns to the trail in the hunt for his family. Now it’s time for Macon and his family!!! The prologue itself is torturously horrifying as the mention of eating human flesh is written so early on. Mark Matthews’ writing is so clear, the reader doesn’t miss a thing – even though they may wish they had at times. But the setting is absolutely brilliant, with the time of day, the contrast from the busy, noisy highway to this dark, narrow, remote trail, the homeless guys that are not even visible in the dark of the bridges and lastly, the tunnels and those that live inside. Whilst reading that Erin and Lyric are being kidnapped I felt cold all over and noticed how tense I was. I could completely connect to this chilling story as my own partner runs marathons and I have a young daughter that uses a stroller, just as Lyric was in hers when she was caught. The experience of reading On the Lips of Children for me has been quite personal and felt quite realistic to the point that, without wanting to, I pictured my own family going through this traumatic ordeal. As a partner, mother and a reader, I had to continue no matter how chilling it was as I simply had to know the outcome. All of the characters were written absolutely brilliantly, and Macon and Erin do have well-written, dark histories that the reader comes to discover. I won’t reveal any more but wanted to give it a mention as the plot of this book is so much more than the main capture of Macon’s family. The reader does feel a little torn (if you excuse the pun!) when reading about the scavenging children as they are so young themselves and from a mother’s point of view, you will do absolutely anything necessary to keep your babies alive! My favourite character was Mex, the hotel clerk, simply because of the way in which Mark Matthews has written him. He made me feel uncomfortable. Can he be trusted? He suggested the route that Macon should run. I thought he was the evil behind this somehow. Yet he alarmed Macon to his missing family as he told him when they’d left and where he thought they were going. But he was outside the hotel door with Lyric and seemingly awkward? He was aware of something surely? Did he tell Macon where his family was in order for him to get captured too? I had so many questions surrounding this one character. On the Lips of Children is absolutely horrifying, and at times upsetting. It is very quick-paced, just the right length and it does wrap up at the end, leaving no questions unanswered. It is a novel that will give you the heebie jeebies so if you are looking for a good scare this book is certainly up your street. A marathon like no other!!! A Reader’s Review Blog received a copy of On the Lips of Children from the author, Mark Matthews, in return for a fair and honest review. We would like to thank Mark Matthews for the copy of his work. The paperback copy of On the Lips of Children will be released soon this month. If you would like to check it out on Amazon.com or Amazon.co.uk just click on the relevant one where it will take you direct to the Kindle edition. Mark Matthews is a writer and therapist from Detroit and is the author of 3 novels. 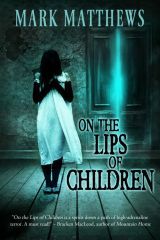 On the Lips of Children is his latest piece of dark fiction and has just been released from Books of the Dead Press. His first novel, STRAY, is based on his experiences working at a substance abuse treatment center. He is an avid runner, and has two running based works including The Jade Rabbit and Chasing the Dragon: Running to Get High. He has been in recovery from addiction for over 20 years. Follow his blog at Running, Writing, and Chasing the Dragon at http://markmatthewsauthor.blogspot.com/. Here is a very cool blog post about the background of the novel on how it is based partly on the children’s book “Where the Wild Things Are” called ‘The Night Max Wore His Wolf Suit’ http://markmatthewsauthor.blogspot.com/2013/07/WhereTheWildThingsAre.html. This entry was posted in Horror, Psychological, REVIEWS (ALL) - Reverse Chronological Order and tagged chilling, disturbing, eating of human flesh, horror, quick-paced, terrifying. I also loved Caroline’s review and although I do like paranormal I am a bit too scared of truely gruesome events such as flesh eating of this sort! It does sound like a captivating read for fans of horror though. Thanks for your kind words, Peter. They mean a lot. It is understandable that this book will not be everybody’s cup of tea due to the horror, gore and sheer realism. It is very much similar to the works of Stephen King and the like, and so those that do love these are sure to love On the Lips of Children. Happy Halloween, readers. If you’re looking for something that’s chilling-to-the-bone to read on this cold, dark day then you may want to try Mark Matthews’ On the Lips of Children! You’ll most certainly need those bed covers to hide behind!